Frost held the grass still, early this morning. Birds sang. Daffodils, without the nods of breeze, seemed lost in dreams. Today they took Clarrie to the crematorium. There will be a fine view over the woods from there. Maybe the starlings will fly, make sympathetic murmurations over the canopy of Cardinham. Grandchild 2 passed the pegs, while we hung out washing on the rotary lines. 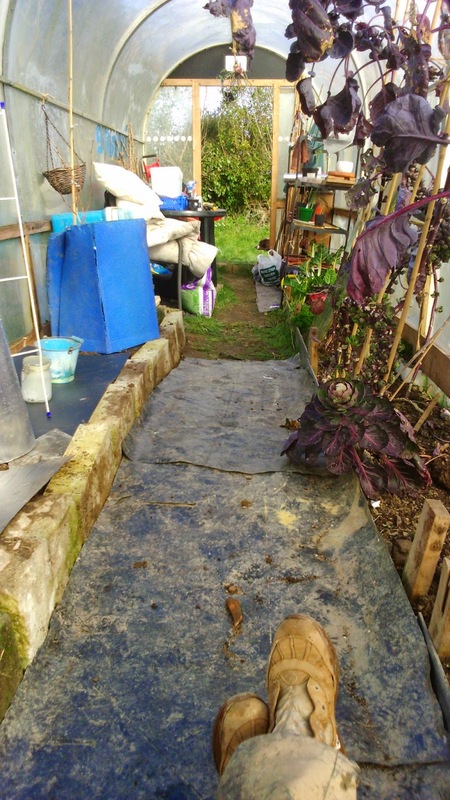 My back ached from levelling soil, from making new beds in the polytunnel: we will grow melons for the summer. She helped to seal the envelope of the memoriam card, carried it to Carol next door, for passing on at the service. Ron was going up to feed the chickens: the little one went up too, made backward skips away from the pecking. Grandchild 2 came back beaming, holding a large white egg. She loved it too much to eat it right away. We went home to have pasties for lunch. ‘What shall we do next?’ I asked. We called Granddad down from his shed workings. Lilly Scare The Crow took up her residence over a vegetable bed. My back ached, it couldn’t be ignored; the end house stood empty, not even a tea towel on the line. But the sweet peas will come again, in the sun, simmering fragrance. This is sad and lovely, Lisa. New life accessing the old in simplicity. My compliments to you all. The land is so lush and beautiful. Sad for your loss. (smile). Glad for the peas.